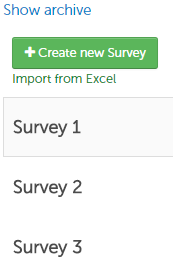 Select the survey you want to archive, scroll to the bottom of the page, and click on “Archive survey”. This also displays the “Show archive” folder where you can view all archived surveys. You can also remove archived surveys from the archive.